Since l986 Mekong River Textiles has worked directly with weavers to bring you handwoven silk and cotton fabrics, scarves and shawls from the looms of Thailand, Laos, and Cambodia. Our patterns and wearable art creations made in our Maryland studio honor the textile traditions we embrace and celebrate the accomplishments of these skilled artisans. This is a site for textile enthusiasts, designers, fiber artists, sewers and others who appreciate the look and feel of handwoven and hand-dyed textiles and who value the small miracles of beauty appearing as artisans throw the shuttle, take a stitch, or dye yarn. Our weaving cooperatives empower women to create better lives for their families, send their kids to school, and dream of a better future. As their creativity feeds families we marvel at the richness of their culture and traditions informing the textiles and give thanks for the beauty that touches our lives. *To place an order, please contact us at (301) 589-1432 or info@mekongrivertextiles.com. We accept MasterCard, Visa and American Express. Susan L. McCauley studied art history at the University of Mary Washington in Virginia, and she became interested in hand weaving, spinning, and dyeing through studies at Penland School of Crafts in North Carolina and Sheridan School of Design in Canada. After serving as a museum curator at historic sites in Virginia, Susan moved to Thailand for three years. 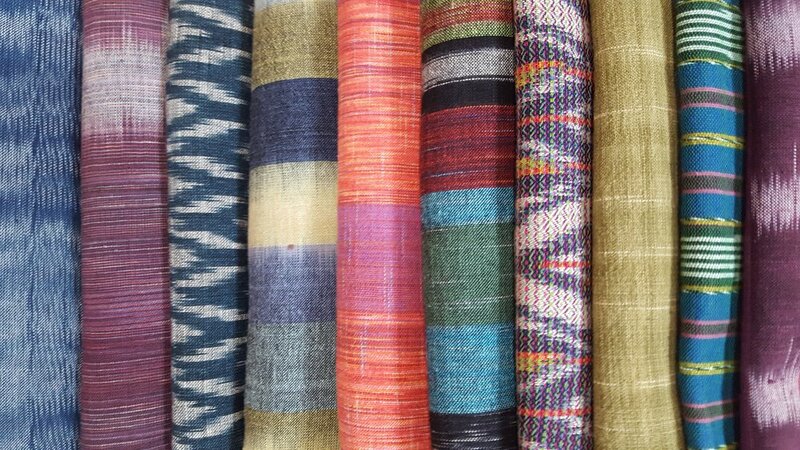 There she saw the extraordinary work of NE Thai weavers making "ikat" resist dyed indigo "phasin" textiles. Her travels in Thailand took her to rural upcountry areas where she learned about the lives and weaving skills and traditions of the artisans taught by their mothers and grandmothers. In that community that offered cultural richness amidst much poverty, Susan joined a group attempting to reverse the migration of young girls to Bangkok's brothels by creating weaving jobs in the villages. She continues her work by returning each year, and she also travels to Laos where she supports expert weavers in remote highland areas. Through her business Mekong River Textiles, Susan promotes weaving cooperatives and other producers in Thailand, Laos, and Cambodia and advocates for eco-friendly production methods and fairly traded goods. Her efforts are dedicated to sustaining the textile arts by supporting the weavers and their culture, families, and communities. Over 30 years in business, Susan has developed a body of creative work with her fabrics, clothing designs, and patterns inspired by SE Asia's handwovens which can be seen at her showroom in Silver Spring, Maryland. We have worked with the Thai Craft Association, a certified member of the International Fair Trade Organization, for many years and share its commitment to fair pay and healthy working conditions. During 30 years of working in Thailand we've seen our weavers improve their daily lives in meeting nutritional, educational, and other needs through sales of their needlework, hand-woven fabrics and other products. This added income promotes harmonious family life and creates self esteem while maintaining indigenous textile traditions. 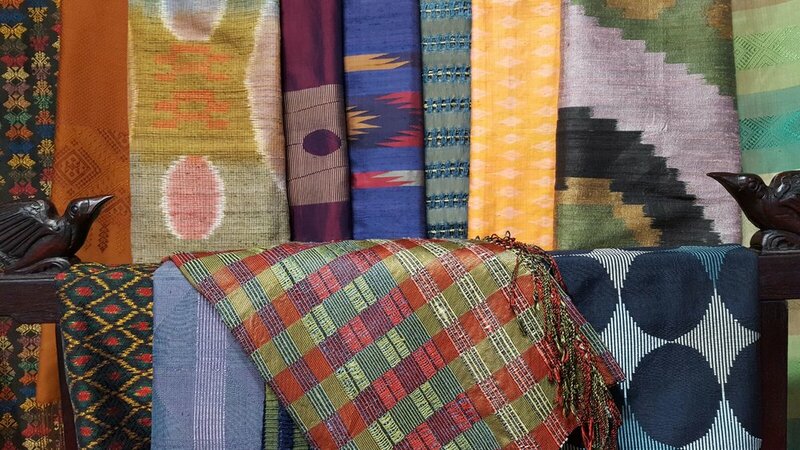 Our Thai artisans are part of the OTOP (One Tambun One Product) local production program of the Royal Thai Government. We visit our weavers annually to maintain our partnerships and to ensure the well-being, health, and safety of the workers as well as the quality of their products. Since 1981, Good Shepherd Sisters in Nong Khai Thailand has been dedicated to preventing and eradicating human trafficking through their training center for young at-risk girls. Here the girls are provided safety and learn weaving and other developmental skills while they build new lives and new futures. Over 900 families have benefited from the work of the Sisters and we are pleased to offer their very special ikat-patterned hand-woven fabrics. Patricia Cheesman of Naenna Studio in Chiang Mai, Thailand founded "Weavers for the Environment" and initiated a new waste treatment system for dyers in local villages. She actively promotes safe dye and eco-weaving practices while educating artisans about natural dyes and sources for sustainable gardens. The Thai government now certifies hand weavers and dyers who graduate from their "Green Product" safety program through the Department of Environmental Quality Promotion. Mekong River Textiles is dedicated to promoting and sustaining traditional textiles of mainland SE Asia through development of the textile arts and support of its weavers. Cottons may be machine-washed separately on gentle cycle and machine dried on medium heat. After several washings you may find ironing unnecessary. Remove clothing when still damp and finger press edges. May iron on hot setting. Silks may be hand-washed or dry cleaned. To handwash, use a mild soap such as Orvis with lukewarm water and soak your item for several minutes in a basin. Agitate gently, but be careful not to wring your silk. Hang to dry away from direct sunlight and iron while still damp. Alternately, you may roll the silk in a towel to absorb the moisture and then place the silk in a clean plastic bag in the freezer for a couple of hours. The ice crystals on your silk make ironing a breeze. Do not bleach silk. Use a medium heat iron setting.